CINCINNATI -- What’s your idea of the perfect Valentine’s Day? Everyone can do the dinner and flowers thing, right? And anybody can catch a romantic movie or take a moonlit walk. Great events, all. But they’re a bit cliché for your loved one if we’re talking about being as creative as you can be on the most romantic day of the year. "What I've noticed is that people are trying to make date night more exciting no matter the time of year," said Lizzie Kibler, content specialist for DateNightCincinnati.com . "However, when it comes to Valentine's Day, people act like they have to come up with something super unique or weird. "I personally think Valentine's Day is special, but it is just another day. Couples should be trying to find those unique date ideas all year round. I think it keeps things interesting." So what should you do? Fear not. We’ll hook you up. Also: The Taft Museum of Art has been known to do this as well. Check it out for wine and art! 2. Take flight on a helicopter tour. What’s the most unique way to experience Cincinnati? From overhead. Stratus Helicopters feature an "ultimate date-night tour" when you can "see Fountain Square, Mirror Lake and Eden Park from the air"for $65 per passenger. More from the site: "Fly eye-level with the top of the Great American Tower and over the P&G Towers. Then you head out toward Mt. Adams to see Mirror Lake in Eden Park and the Cincinnati Observatory before descending back down the river and city skyline to our Newport Riverfront Heliport location." Whatever you do, don’t forget the hairspray. To schedule your flight, call 513-533-4354. 3. Head for a bed-and-breakfast in Burlington, Kentucky. First Farm Inn : These are country rooms with 21st-century amenities -- and maybe you can do some horseback riding, too. Willis Graves Bed and Breakfast : Luxurious baths, comfortable decorated with antiques, and fresh-baked cookies await! 4. Ride the Cincinnati Dinner Train . "There are only about 10 dinner trains still in operation in the United States," their site states. "That makes this experience even more special! The Cincinnati Dinner Train transports up to 148 dinner guests back to the era of the 1940s on a three-hour train ride inside three vintage dining cars." Dress business casual and enjoy the dinner. Train departs in Oakley. Call 513-791-7245 for more information. Of course, Kentucky offers an option, too, in Bardstown with the My Old Kentucky Dinner Train : Enjoy a fine dinner aboard a 1940s dining car as you wind your way through the Kentucky countryside. 5. A foosball challenge in Florence, Kentucky? Get ready to bring your A-game as you challenge your love to a game of foosball -- or anything else -- at the new Dave & Buster’s in Florence, Kentucky. It’s actually the only Dave & Buster’s in Kentucky and, in case you haven’t heard about these joints, they’re "art sports bar, part arcade, part restaurant and 100 percent fun," according to their website. It’s 30,000 square feet of Valentine’s Day excitement. And on the Cincinnati side, who could pass up the chance to challenge their love to some old video games? That means a ride to 16-Bit Bar and Arcade in Cincinnati -- but do not try to top my score in Ms. Pac-Man. Whether it’s at the Arthur Murray Dance Studio , the Mad Frog , the Mt. Adams Pavilion , or even the Ritz Ballroom and Dance Studio , you can learn how to shimmy the night away -- then invite your love to try it with you. And Cincy ain’t like that town in "Footloose." Here, "Dirty Dancing" is encouraged! 7. Take a road trip to visit Ohio’s Amish Country. 8. Explore Lexington, Kentucky’s horse parks . 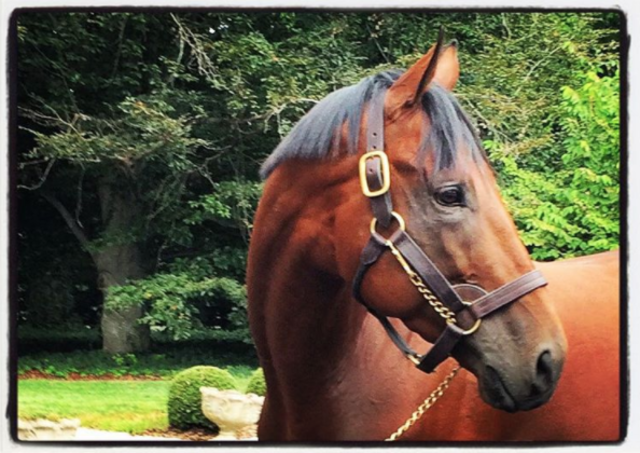 Want to see a Triple Crown winner? How about some of the most successful horse breeders in the world? You can -- and it’s all just a couple of hours down the road. In Lexington, Kentucky, you can spend a romantic weekend inside the white picket fences of the town’s beautiful horse farms. Feed a thoroughbred and take a selfie! 9. Take in a castle or two. In Versailles, Kentucky, you can explore the Castle Post , a genuine castle turned into a bed-and-breakfast located right off the interstate. Legend has it, a man built the castle for his wife, so the romantic ambiance is just right for a romantic getaway. In Loveland, you can check out the Loveland Castle (though only on weekends now, due to the castle’s weekend schedule). Take the self-guided tour and see for yourself if the place is truly haunted. Ready to go? Good. You can thank us later.